The U78 Duty USSS Collapsible Baton Holder from DeSantis rides securely at the hip, placing a reliable non-lethal defensive option within easy reach. 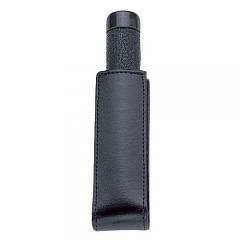 It holds and allows quick access to a 16 or 21-inch collapsible baton. An elastic gusset holds the baton firmly in place without any obstruction from a top flap, allowing rapid access in high-pressure situations. The holder is made from tough black leather for durability and a professional appearance, and comes in a plain or basketweave finish. It attaches to a 2.25-inch wide duty belt using a secure snap closure.